The students painted these colorful pieces in preparation for Thanksgiving, and in conjunction with their social studies unit. We talked about shape, organic verses geometric. 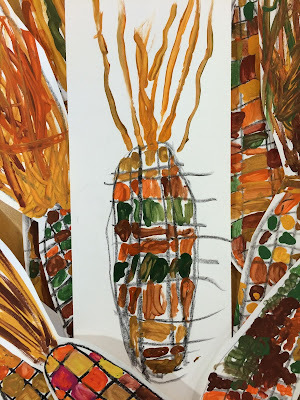 We looked at the patterns on the corn. We admired the wonderful toned down color palette. We began by drawing the elongated oval shape of the corn. We added vertical lines with black crayon then horizontal lines. We painted in the newly created pattern with tones of red, orange, yellow, green and brown. The husks were the last detail to be painted. At the end of the lesson I introduced them to the story of the "Three Sisters" corn, green beans and squash. All the students were successful with this lesson which covered one forty minute art class. Wow - you brought back a memory for me! I used to do a very similar Indian corn project with my first graders, but over my last few years of teaching somehow I just never got around to it. We used to have access to these over-sized cotton swabs, and we made the kernels with dots of paint. Or sometimes we used pencil erasers to stamp the kernels. HI Phyl. Nice to hear from you and happy to bring back a memory. I haven't repeated this lesson in a while now and was happy with the results. It was the perfect lesson on the day before a holiday.